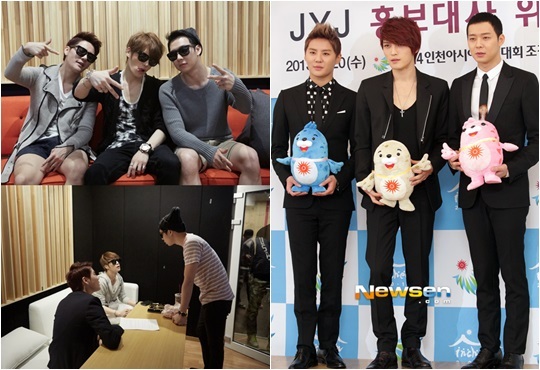 A photo of JYJ inside their recording studio has become the center of the netizens’ attention. The photo was revealed on the 2014 Incheon Asian Games committee’s official Facebook page (www.facebook.com/IncheonAG2014) and was taken while JYJ were recording their Incheon Asiad song ‘Only One’. Meanwhile, the released photo showed the members of JYJ seriously discussing their music as the honorary ambassadors of the 2014 Incheon Asian Games, as well as making mischievous poses at the camera. The committee has announced that it will also be releasing solo shots and photos of JYJ practicing their choreography during the week through their Facebook account. The full audio and music video of ‘Only One’ will be revealed on the 16th of September. ← [TRANS] 130905 [Message From TVXQ] [U-Know] A Great Day!